So I never imagined that 22 years after earning my bachelor’s degree in business administration that I would be attending school again. But here I am taking classes, prerequisites for a Masters in Art Therapy program that I will begin in 2014. After my first week of school, I can happily report that I really enjoy learning and look forward to the challenges and deadlines. I am actually excited about writing a paper in Lifespan Psychology and am ready to dig into research. I’m also jumping into my homework, reading ahead and planning my week realistically. I believe it is the only way that I will be able to balance running our own business, homeschooling our last student, and continuing along my own creative path. While much of the artistic technique I have learned has either been by reading books, experimentation, or taking workshops, I am looking forward to the longer challenge of a semester class in both drawing and ceramics. While I have dabbled in drawing before, I have not maintained a good practice of drawing, so I’m hoping to see great improvement by May. 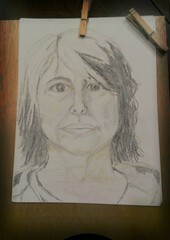 Here is my first self portrait in some years with just a pencil. My eyes and lips are too big and my nose is too small, but when I squint, I can tell it is me. I am happy that it is still better than my very first self portrait ever drawn in 2008, yet I am ready to better learn the little tricks to drawing life-like and proportionately accurate. Something I’ve noticed that has me excited about school is my end goal. I know I need to work through these classes to be able to do what my heart was made to do: art therapy. Although I feel quite drawn to a client base of the homeless or devalued women population, I am quite ready to go where ever God leads me on this journey. He has been known to do things in unexpected ways, so I am looking forward to this adventure. Once I figure out the rhythm of my life this semester, I will be posting a new class schedule for 2013. I have received several requests for a new soldering class, so I hope to have the information out in a few weeks as to what will be offered. Stay tuned…. so glad you are loving the learning and starting out knowing you need to keep the balance in life. grace and peace! We are very similar in our life paths. I have one more year homeschooling my youngest and I’ve been debating about going back to school in art specializing in metalsmithing. I have a BS degree in engineering technology from way back when. Glad to hear that you are enjoying the process so far. God bless you and keep us posted! Can’t wait to see how everything unfolds for you. From what I know of you, this is such a perfect path. I love working on the wheel! Always a barometer on how one is feeling. If you’re not centered, there’s no way that lump of clay will get centered! Wishing you all the best in this return to school. Oh, you will be so good at this! I’m excited to follow your adventures on this new path! Congratulations! To have seen how you have evolved as an artist over the years this is such a perfect fit. I have a few more years of homeschooling left but I too have been thinking about what’s next. :). Enjoy the journey.